ISIS has released a statement claiming responsibility for the multiple bombing that claims over 15 people in Kuje area of Abuja last week. On Friday, 2 explosions rocked Kuje main market. 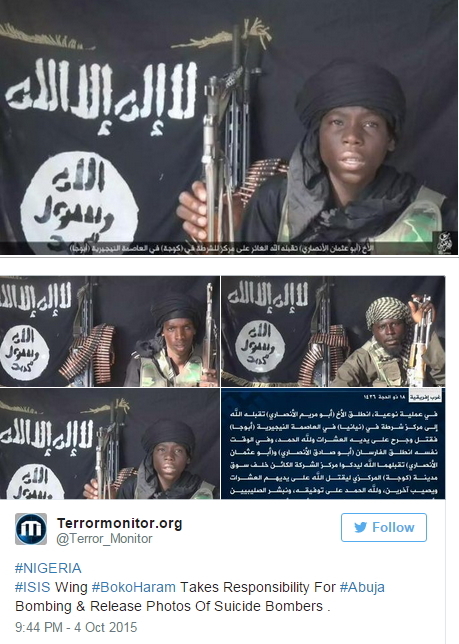 Two days after, a faction of Boko Haram who pledged allegiance to the Islamic State terror group said they carried out the attack. 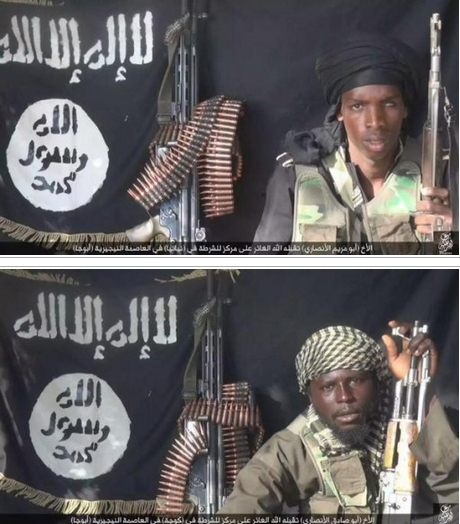 The group also released photos of 3 suicide bombers who carried out the attack. These brainwashed boys believe they will be rewarded in heaven for killing others. It is so sad! Religious extremism is a threat to human existence. those small boy they carry gun 4 Nigeria? 7 virgins!!! THIS PEOPLE HAVE LONG **** THAT CAN ERECT FOR 10 YEARS WITHOUT STOPING that is why they are dying to go and have those virgin. A religion where 95% are illitrate… full of f****ls. So they are enjoying their 7 virgins in hell fire already? I think islamic clerics and their scholars are not even educating muslim faithful enough! I don’t just understand. the earlier Nigerians stand up and tell these northerners to go the better this country will be. see kids killing themselves while their mates in the west and east are busy studing for the development of the country. fools kill themselves because of 72 virgins in hell while those that send them are busy sleeping with the chibok virgin kids. I hate islam, I hate islam, I hate islam. what these guys are doing is clearly written in the Koran and they are the real people that are following the evil cult called *****. God pls wat did we do dat U hv decided 2 punish us wt dis evil cult?